"I'm a simple man. I like pretty, dark-haired women and breakfast food." I'll admit to have never having watched a minute of Parks & Recreation. Who has the time to watch TV? I barely do - pretty much only in cases of new seasons of Stranger Things coming out. I mean, it's been a good five years that Sandy and I have sworn we'd get caught up on Dr. Who - hasn't happened. TV room in our thrid floor attic is way too hot in the summer. But that quote up top, from Ron Swanson, is quite a good one. I agree wholeheartedly. I think I'd like him quite a bit - maybe not as much as breakfast for dinner, and definitely not as much as bacon, and absolutely not as much as bacon for dinner - and maybe one day I'll finally plop down and see what all the fuss is. 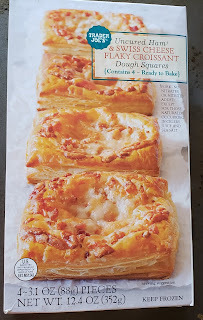 Until then, for dinner, we had Trader Joe's Uncured Ham & Swiss Cheese Flaky Croissant Dough Squares. Here's one breakfast food that decidedly ought to stay at breakfast. It's not that these ham and cheese dough squares aren't any good. They're certainly pretty tasty. There's four per box which bake for about 15 to 20 minutes in the oven, and as one would expect from a croissant-inspired pastry of sorts, they get all light and flaky and crispy and a little greasy. There's such a satisfying bite to a good croissant, and that's what we get here, even if in dough square form. 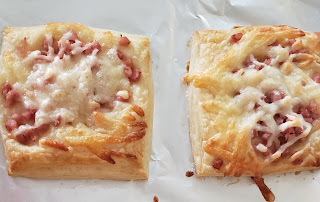 The melted Swiss cheese adds a lot of slightly salty, greasy comfort vibe, while the bits of cubed ham taste actually more sweet than salty, but they work well with the rest of the dish. I think they'd work great for a light breakfast, alongside some coffee and some fruit. There's enough here to have you get up and go. But as dinner? Nah. Too light, I'd say. It's not the croissants' fault - I mean, they are what they are and it shouldn't have been too surprising - but if I had a voracious enough of an appetite, I probably could eaten the whole box. 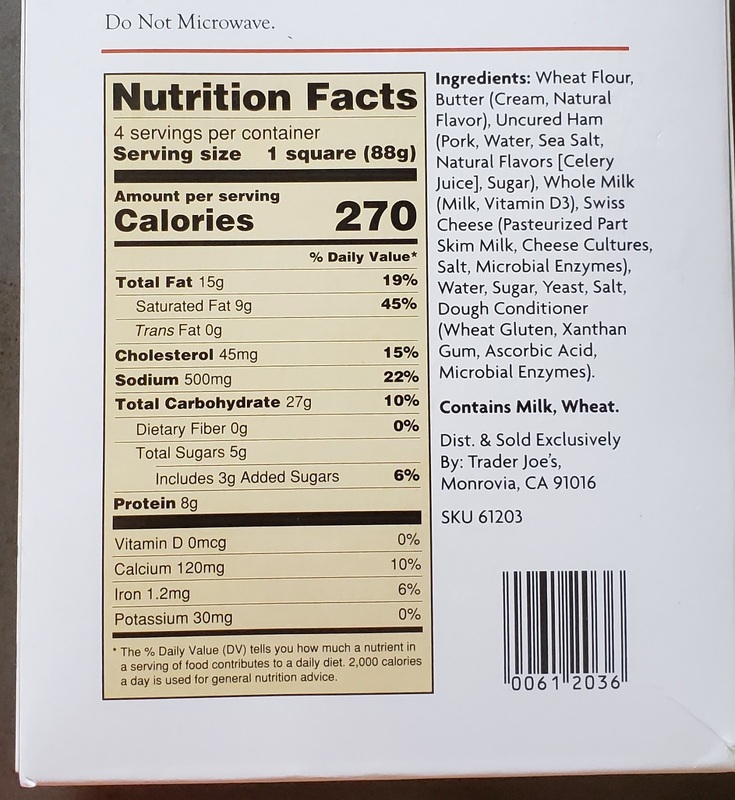 As it was, I was sneaking bites from my kids, who were surprisingly slow at chowing them down despite their proclamations of loving these ham, and cheese squares. My three year old wants to give them 21 Golden Spoons despite struggling to eat half of hers. Also, the name...doesn't it strike you as a little goofy? "Flaky Croissant Dough Squares." I mean, it's a proper description...but I'd go with something else, maybe like "Open Faced Croissants" or something along those lines. 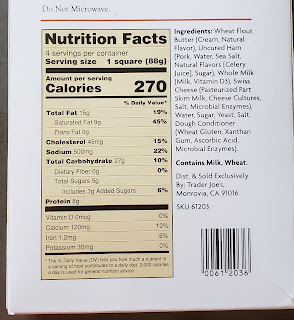 In all, these TJ's ham and cheese squares are certainly decent, to almost pretty darn good. There's nothing utterly spectacular to them, and I'd say that maybe they're missing a small something, like a little spinach or a fancier cheese or a small flavor sprinkle of some type. But for a good, solid, kinda basic croissant-type deal? Not a bad deal at all for about $3. Just bought these last week and they are still in my freezer. I wasn’t really sure whether to make them for breakfast or dinner, so thanks for the recommendation! Tried these today, and beside some fruit and yogurt they were very nice for breakfast. A bit bland, but that’s to be expected from Swiss cheese. I think next time we might try some Everything But the Bagel sprinkle to liven it up a bit. They were ok. They didn't rise that much, and were more chewy and doughy than croissants... definitely not crisp, which was a let down. Won't buy again. Agree with you that these are tasty and it's what you would expect. I liked them.